We are offering our clients Tambourine Musical Instrument. 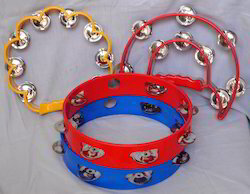 These have Acrylic shell with jingles in different colors and different sizes. 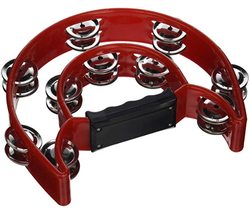 Our offered range of tambourine is made of good iron frames with metal jingles attached to it. With various sizes these instruments are cost effective to afford. With quality product, cost competency and variety these are highly demanded by the clients. Owing to our proficiency in this domain, we are providing our clients an optimum range of Metal Body. Steel Tambourine set in best quality avaiable. Only Wholesale.Worldwide shipping. Tribal Earth Sounds (India) Pvt. Ltd.
We are instrumental in offering a wide range of Indian Dafli to our clients. We are the recognized manufacturer, retailer, importer, exporter and supplier of an extensive range of Percussion Tambourine. Various rhythms can be played on these instruments as these are able to provide the melody of both modern as well as traditional music. We are amongst the reputed organizations, highly engaged in offering an optimum quality range of Tambourine Drum. We manufacture and supply a vast range of good quality Dafli. These are widely known in India due to the many songs and Bollywood movies that have used them. These are known for superior sound quality. As per the needs and requirements of our clients, we are involved in providing Indian Musical Tambourine. Customers can avail from us a melodious range of Tamborines. Also known as Khanjiri in the Indian context, these are used for adding jingle sounds. The small round metallic plates attached on the main body beat against each other when the instrument is shaken. Our tamborines have a wooden body with a mica coating. Moreover, these are offered in the given size: 8". We have carved a niche amongst the most dominant names in this domain, involved in providing superior quality range of Half Moon Tambourine.